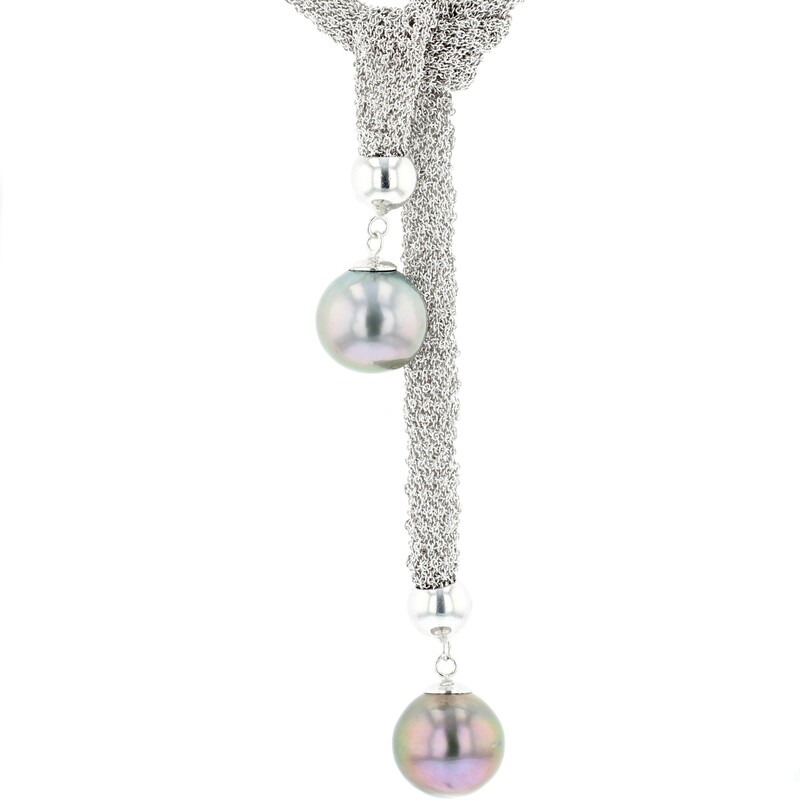 Hinerava’s Signature Collection features an adjustable “Toi & Moi” Tahitian pearl lariat necklace in 18K white gold. The rare and carefully selected 15 mm Tahitian pearls are beautifully contrasting while two gold center bars allow for the length of the necklace to be adjusted in the front and in the back (total length is 32 inches). 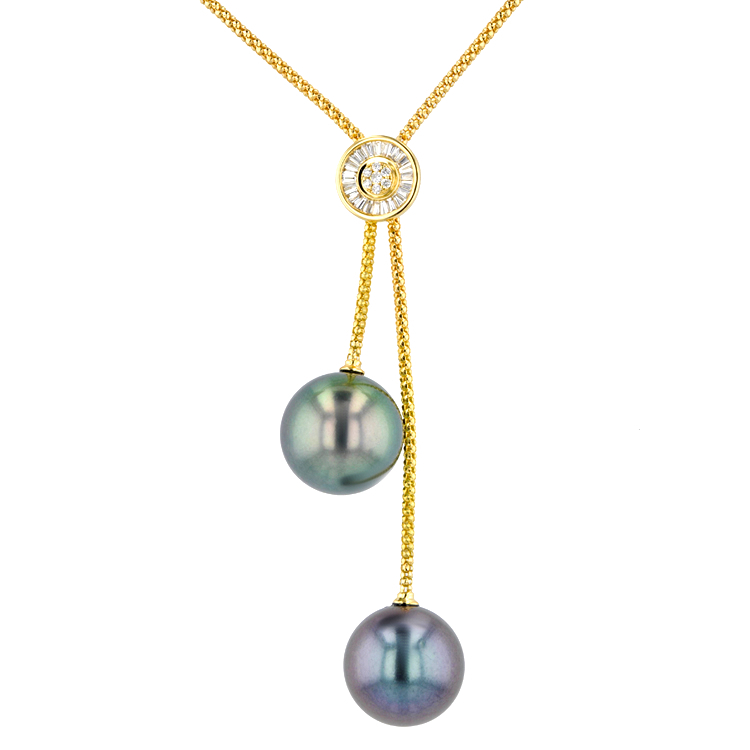 Hinerava’s Signature Collection features an adjustable “Toi & Moi” Tahitian pearl lariat necklace in 18K yellow gold. The rare and carefully selected 15 mm Tahitian pearls are beautifully contrasting while two gold center bars allow for the length of the necklace to be adjusted in the front and in the back (total length is 32 inches). 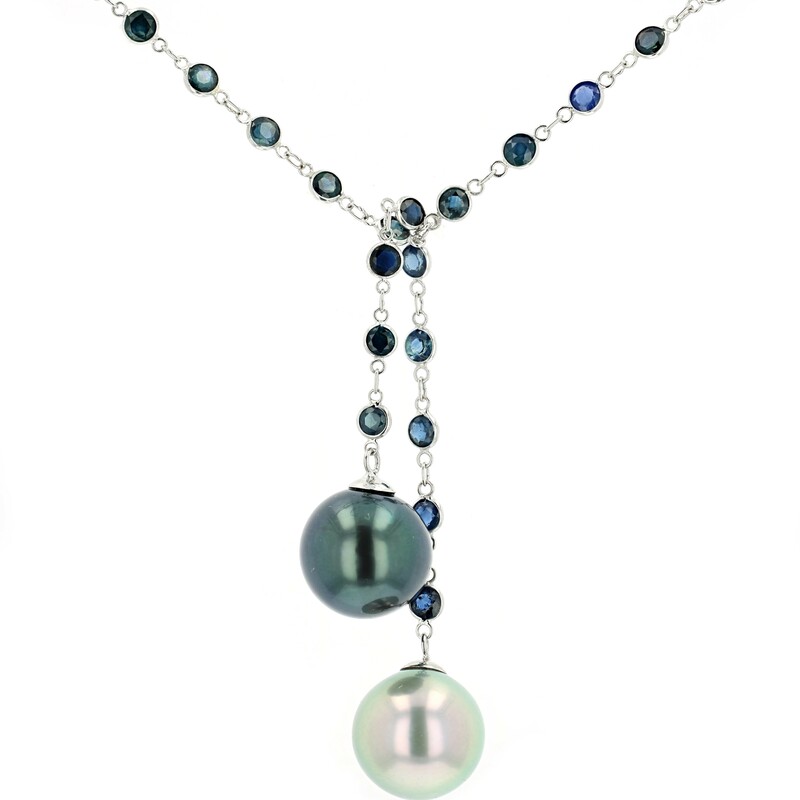 "Hinerava's Poésie Collection features a Blue Sapphire Toi & Moi Pearl Lariat, 10 carats, set in 18K white gold and finished with two exceptional Tahitian pearls. Length : 56 cm. " 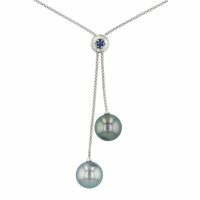 Hinerava’s Elements round mesh pearl lariat features 2 gorgeous 12mm Tahitian pearls. Set in sterling silver, the necklace is supple and ties to variable lengths. Total length is 21". 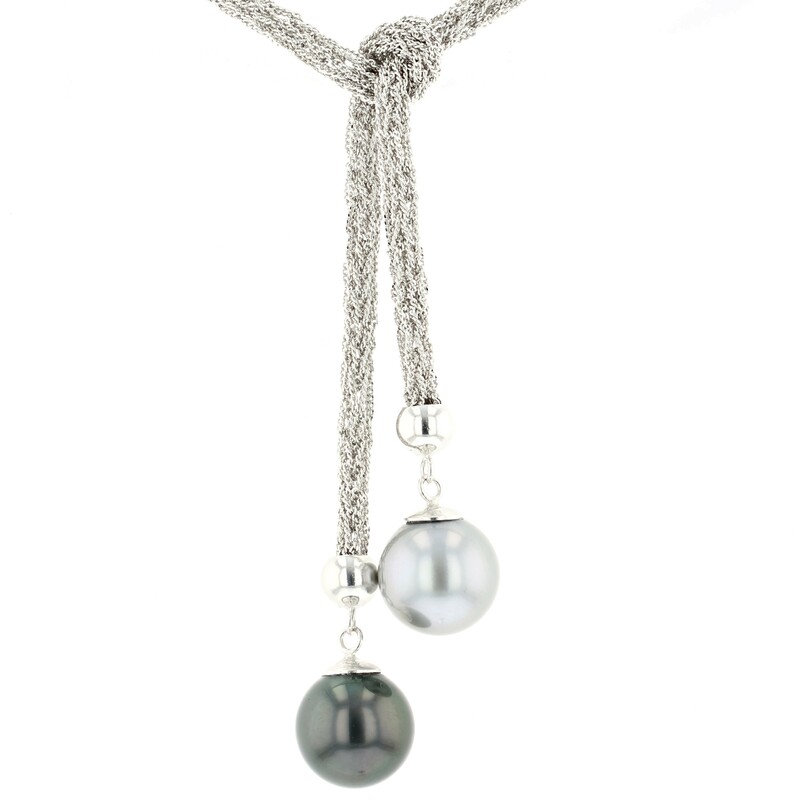 Hinerava’s Elements mesh pearl scarf features 2 gorgeous 13mm Tahitian pearls. Set in sterling silver, the necklace is malleable and ties to variable lengths. 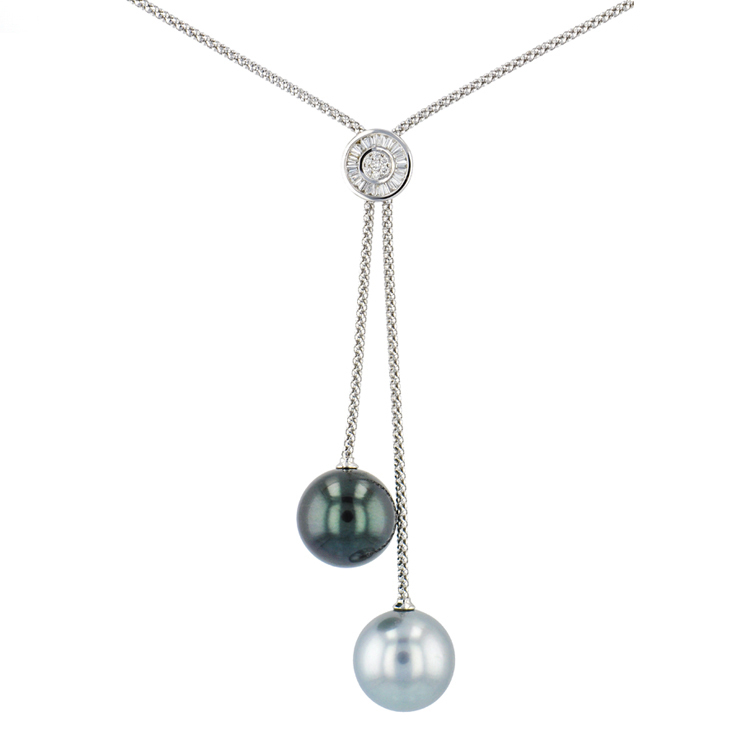 Hinerava's Signature Collection features an adjustable “Toi & Moi” Tahitian pearl necklace in 18K white gold. 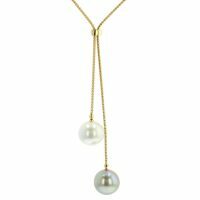 The carefully selected Tahitian pearls are beautifully contrasting while a gold center ball allows for the length of the necklace to be adjusted (total length is 18 inches). 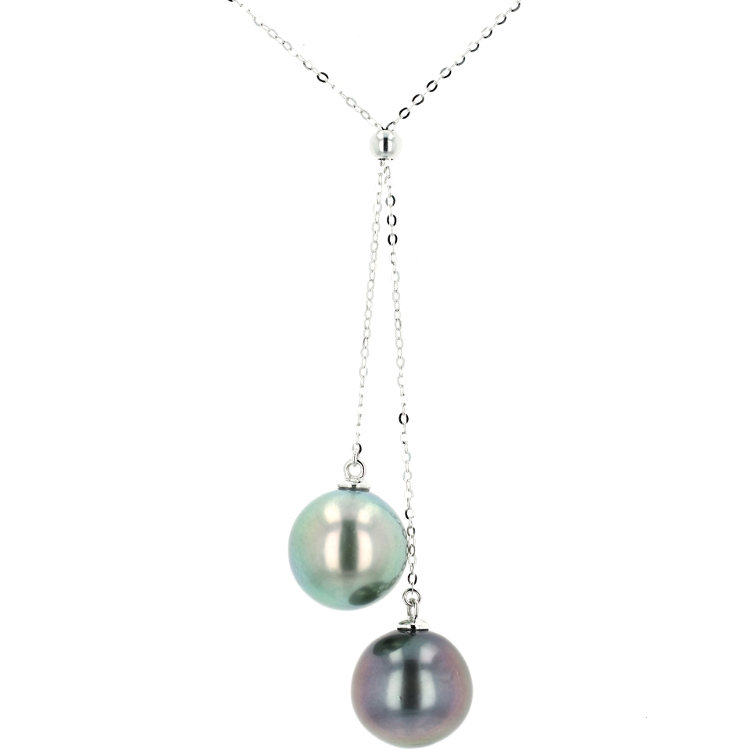 Hinerava's Signature Collection features an adjustable “Toi & Moi” Tahitian pearl necklace in 18K gold. The carefully selected Tahitian pearls are beautifully contrasting while a gold center ball allows for the length of the necklace to be adjusted (total length is 18 inches). This necklace is available in yellow and white gold. Hinerava's Signature Collection presents timeless elegance in its original Toi & Moi lariat necklace, featuring a sliding diamond embellishment which allows for length versatility. The sliding center piece is adorned with brilliant cut diamonds surrounded by baguette cut diamonds, with a total of 0.353 carats. Two exquisite Tahitian pearls are expertly selected to contrast in color, thus epitomizing its name "Toi & Moi" (You & I). The necklace is in 18K White Gold, and measures 30 cm. Hinerava's Signature Collection presents timeless elegance in its original Toi & Moi lariat necklace, featuring a sliding diamond embellishment which allows for length versatility. The sliding center piece is adorned with brilliant cut blue sapphires surrounded by white diamond baguettes. Two exquisite 13 mm Tahitian pearls are expertly selected to contrast in color, thus epitomizing its name "Toi & Moi" (You & I). The necklace is available in 18K white gold. Blue sapphires weight is 0.08 carats and diamonds weight is 0.32 carats. Hinerava's Signature Collection presents timeless elegance in its original Toi & Moi lariat necklace, featuring a sliding diamond embellishment which allows for length versatility. The sliding center piece is adorned with brilliant cut diamonds surrounded by baguette cut diamonds, with a total of 0.353 carats. Two exquisite Tahitian pearls are expertly selected to contrast in color, thus epitomizing its name “Toi & Moi” (You & I). The necklace is in 18K yellow gold and measures 30 cm. 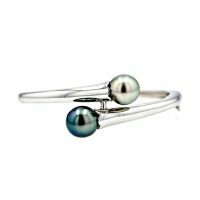 Hinerava’s Absolute Collection presents a fashionable YOU & I Bracelet made of silver with gorgeous 11mm Tahitian pearls.